The periodic Open Streets Knoxville event, comes to an especially interesting mile of downtown Knoxville, this Sunday the 29th from 2 to 6. The rare pedestrian experience always involves about a mile of streets, but this time, for the first time, it&apos;s a bent mile, with a right angle in the middle. 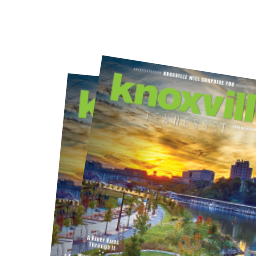 It’s an especially historic elbow of the city, but also pivotal to Knoxville’s near future. The city will close the 120-year-old Gay Street Bridge to automobile traffic, as well as part of Sevier Avenue down to the city’s new Suttree Landing Park, making it safe for pedestrians, bicyclists, children, and dogs. It affords a rare opportunity to cross our oldest bridge across the river without the impertinence of vehicles. As you cross the bridge going south, you’re retracing the hoof steps of the outlaw Harvey Logan, a.k.a. Kid Curry, and the horse he rather urgently borrowed from the sheriff, as he escaped the Knox County Jail—and the law, forever—in June, 1903. It’s pretty remarkable that Butch Cassidy’s hit man, arrested after shooting two Knoxville cops in a saloon fight in 1901, was last seen alive fleeing across this bridge, the very same bridge we take to drive to Ijams or the Alliance brewpub. Then, at the south end of the bridge, turn left—I think Mr. Logan turned right—and you’re on Sevier Avenue, significant old industrial and commercial riverfront street, following the route crowds took back in the 1880s when they went to autumn fairs and horse races. The riverfront space we have known for just the last year as Suttree Landing Park—so named because it’s the approximate location of some memorable scenes involving a police car in Cormac McCarthy’s 1979 novel, Suttree—was once the site of Knoxville’s favorite racetrack. Once leased by former slave and lover of thoroughbred horses Cal Johnson, before he established his own track in East Knoxville, the riverside track was a half-mile oval used in the 1880s and ‘90s for both horse racing and bicycle racing. The racetrack’s gone today, but it’s still a nice place to relax and look at the river and contemplate life’s oddities. Like that odd concrete tower across the river, at the east end of the marina, is the original 1894 water intake for the city’s first modern water plant. When you go to Suttree Landing, just be nice. In another October, in 1882, an argument between two hotheaded tycoons, on this very spot, led to the triply fatal Mabry-O’Conner gunfight on Gay Street the next day.